What we know of as Chateau Lilian Ladouys today, began to gain fame in 1654 when it was known at that time under the name of La Doys. As you can guess, in time, La Doys morphed into Ladouys, which is how the estate earned its name. In those days, it was known as Chateau Ladouys. During the 18th century, Chateau Ladouys was purchased by the Barre family. The Barre family remained in charge of Chateau Ladouys for more than 150 years. The Barre family were responsible for constructing the chateau that is still in use at the property today. To insure the family name remained intact at the property, they added their initials, AB, for (Auguste Barre) to a cornerstone on one the the twin towers. The other tower has stone etched with CL, for Chateau Ladouys. By the early 1900’s, due to neglect and a lack of funds, Chateau Ladouys slipped into a dilapidated state. The owners of Chateau Ladouys were forced to sell some of their Saint Estephe vineyards to help pay off debts they had incurred. The fortune and condition of what was about to become Chateau Lilian Ladouys did not begin to be rectified until the new owners, Christian Thieblot and Lilian Thieblot begin to invest and modernize the estate. If you are wondering why you never see older vintages of Chateau Lilian Ladouys, the answer is simple. It was under the stewardship of the Thieblot family, that the name of the property was changed to Chateau Lilian Ladouys, in honor of Lilian Thieblot. This took place in 1989. 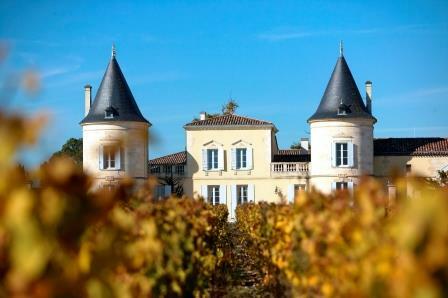 In 2007, the light, yellow tinted chateau and vineyards of Lilian Ladouys was resold to Jacky Lorenzetti. Jacky Lorenzetti earned his fortune as the founder of Foncia, a massive French and European, real estate company. Lorenzetti also owns the rugby team, Racing Metro 92. The Lorenzetti family continued adding to their portfolio in the Medoc with the purchase of Chateau Pedesclaux and a smaller estate, also located in Pauillac, Haut Milon. In February, 2013, Jacky Lorenzetti added to their Bordeaux holdings with the purchase of 50% of Chateau dIssan in the Margaux appellation. The 47 hectare Left Bank Bordeaux vineyard of Lilian Ladouys is planted to 62% Merlot, 33% Cabernet Sauvignon, 3% Cabernet Franc and 2% Petit Verdot. This represents a major change in the vineyard that was previously dominated by Cabernet Sauvignon. The Petit Verdot vines were also a new addition to the varietal makeup. The vines are old at close to 40 years of age. The oldest vines are 60 years of age. The vine density ranges from 8,000 vines per hectare to 10,000 vines per hectare. The terroir is typical of St. Estephe with its gravel, clay and limestone soils. However, the makeup of their Left Bank vineyards and soils are slowly changing, due to exchanges with other Saint Estephe vineyards, giving Lilian Ladouys less limestone and increased gravel and clay in their soil. As the new vines age and are better integrated into the vineyard, the wine will show more richness and depth. To produce the wine of Chateau Lilian Ladouys, vinification takes place in temperature controlled, stainless steel vats. 48 vats in total are used. The vats range in size from 54 hectoliters to 172 hectoliters. Malolactic fermentation takes place in tank, with the exception of 10% of the fruit, which goes through malolactic fermentation in French oak barrels. The wine of Chateau Lilian Ladouys is aged on average in 40% new, French oak barrels for between 14 and 16 months. The best vintages of Chateau Lilian Ladouys are: 2018, 2017, 2016, 2015, 2014, 2012, 2010 and 2009. The annual production of Chateau is close to 20,000 cases of St. Estephe wine each year. There is a second wine, La Devise de Lilian. The property is consulted by Emmanuel Cruse who owns and manages Chateau dIssan in the Margaux appellation. Chateau Lilian Ladouys can be enjoyed somewhat early. However, the wine is often better with at least a few years of bottle age. Of course that can vary slightly, depending on the vintage. Chateau Lilian Ladouys is usually best enjoyed in the first 10-20 years of life. Young vintages can be decanted for 1-2 hours. This allows the wine to soften and open its perfume. Older vintages might need very little decanting, just enough to remove the sediment. Lilian Ladouys is best served at 15.5 degrees Celsius, 60 degrees Fahrenheit. The cool, almost cellar temperature gives the wine more freshness and lift. Lilian Ladouys is best served with all types of classic meat dishes, veal, pork, beef, lamb, duck, game, roast chicken, roasted braised and grilled dishes. Lilian Ladouys is also good with Asian dishes, hearty fish courses like tuna, mushrooms and pasta. Licorice, black raspberries, tobacco, smoky cherries, spice and cedar characteristics come out in this medium/full bodied, dusty textured, forward wine which ends in a soft, red berry finish. Made from blending of 50% Merlot, 43% Cabernet Sauvignon and 7% Petit Verdot, the wine reached 13.2% alcohol. Fresh, spicy cassis, licorice and blackberry have exploded all over the place in the best vintage yet for Lilian Ladouys. With textbook tannins, fresh fruit, length and lovability, the wine was made from a blend of 62% Merlot, 32% Cabernet Sauvignon and 6% Petit Verdot with 13.6% alcohol and a pH of 3.67. Cedar, tobacco leaf, cigar wrapper, wet earth, red plum help create the character here. The wine is medium-bodied, forward, soft already expressive with its crisp, lively finish. Cassis, cranberry and spice, medium-bodied and soft on the palate, this wine is fresh, bright and crisp in its red berry character. Licorice, black raspberries, tobacco, smoky cherries, spice and cedar characteristics come out in the medium/full bodied, dusty textured finish. Medium bodied with ripe red berries and earthy scents, this soft textured, easy to drink St. Estephe wine is best enjoyed in its youth. If you're looking for value priced Bordeaux with character, this is a great choice. Light, fading, more tobacco and earth on the nose than crisp, sharp red fruits in the finish. Drink up.